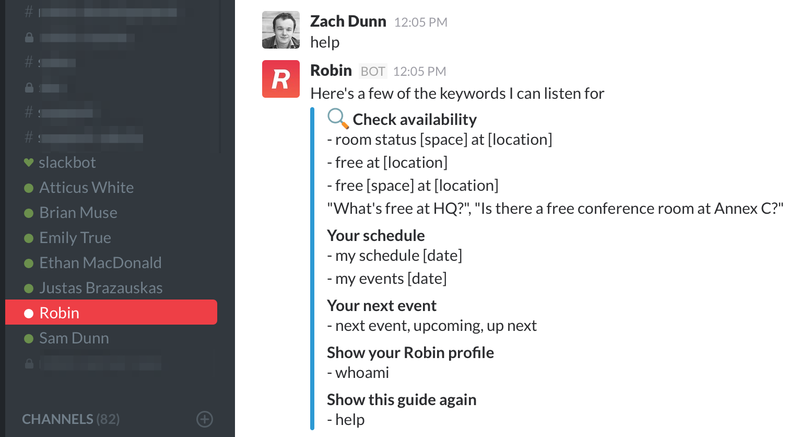 After months of “Do you [colorful expletive] have Slack yet” emails, we’re happy to release a preview of the official Robin bot for Slack. It’s a landmark day for robotic office employees everywhere. 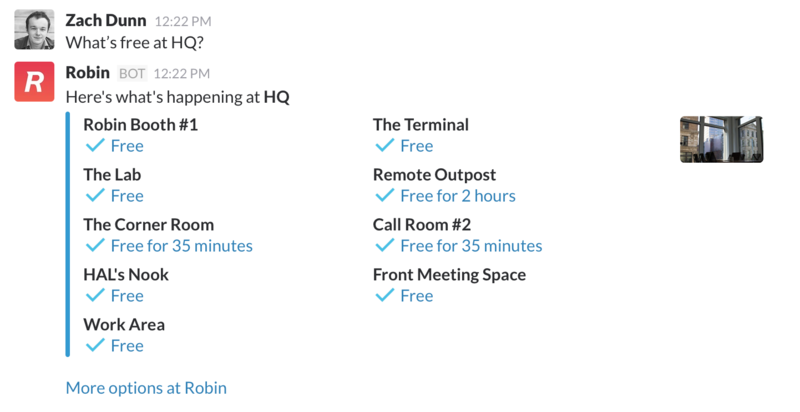 We use Slack at Robin for coordinating everything from office lunch votes to server reboots. Given how much our human team relies on it around the office, and it’s only fair you should be able to include the office itself in the conversation. That’s where Robinbot comes in. 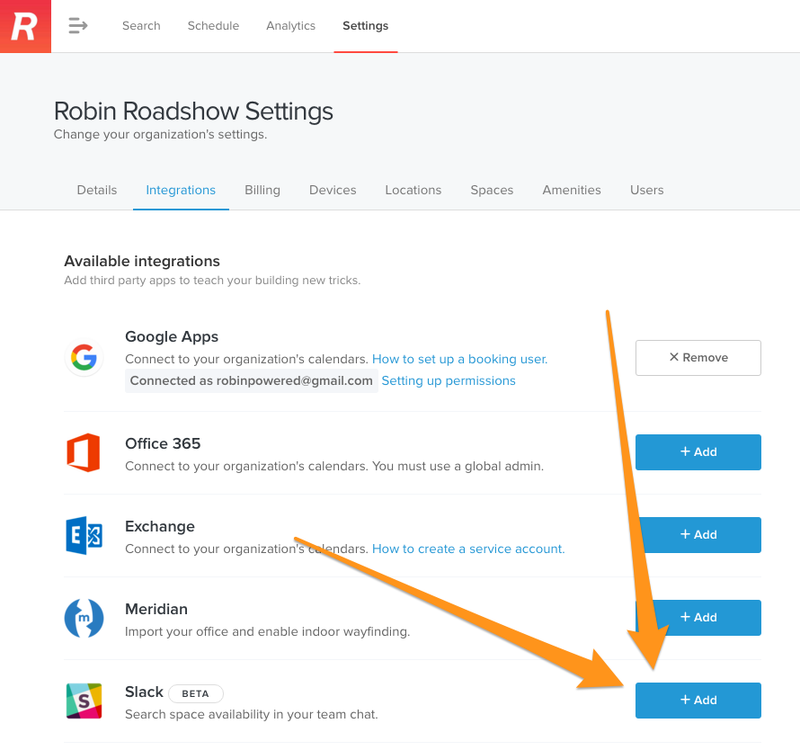 Robinbot is a direct connection to your office in Robin via chat message in Slack. Today you can use it to look up office availability, get the day’s itinerary, or just grab a quick link to an upcoming event. It’s still learning how to talk to humans, and is getting smarter with every work day. With your help, we’ll have it reading (and scheduling) at a 5th grade level in no time. What’s next for your new office bot? The team is actively working on more ways to make Robinbot less of a summer intern and more of your full-time coworker. We believe this kind of office bot is most helpful as a connector to important parts of your workday… even if that means stepping out of the way for a few moments. 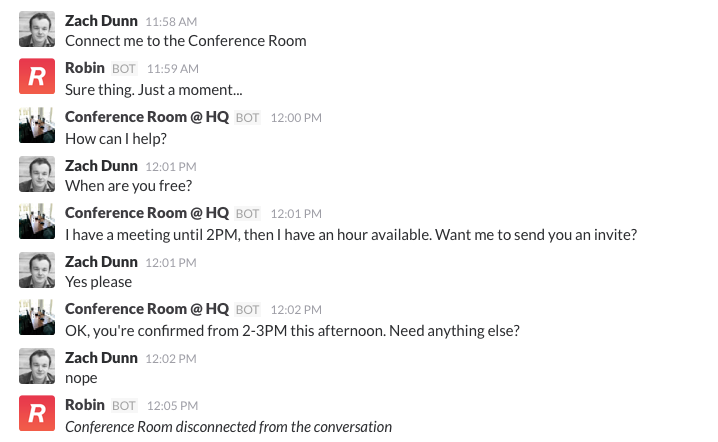 Here’s a preview of some interactions you’ll start to see appear as Robinbot completes more job training seminars. Need to book a new meeting? Just send a direct message to Robinbot and you’ll work it out in no time. When scheduling a meeting, why not talk directly to the room? Thanks to some early adopters, Robinbot has already reported to work at dozens of offices around the world. There’s still a lot left to do, but we’re finding this approach is amazingly easy to work with and we could not be more excited to share more updates with you over the coming weeks. You can install Robinbot for your team using this guide. We’re not on the Slack app directory yet, but we’ll update here once we have an official link. Want to see Robin in action? Go here. Highlights from the past month-ish, including recurring events for Google, more check in configuration, and a slew of “Oh neat” scheduling upgrades.